The University of Rochester is an institution dedicated to the discovery of knowledge through research and education. The College, in particular, is a community of people who come together in a residential learning environment to learn, teach, or work in service to these endeavors. 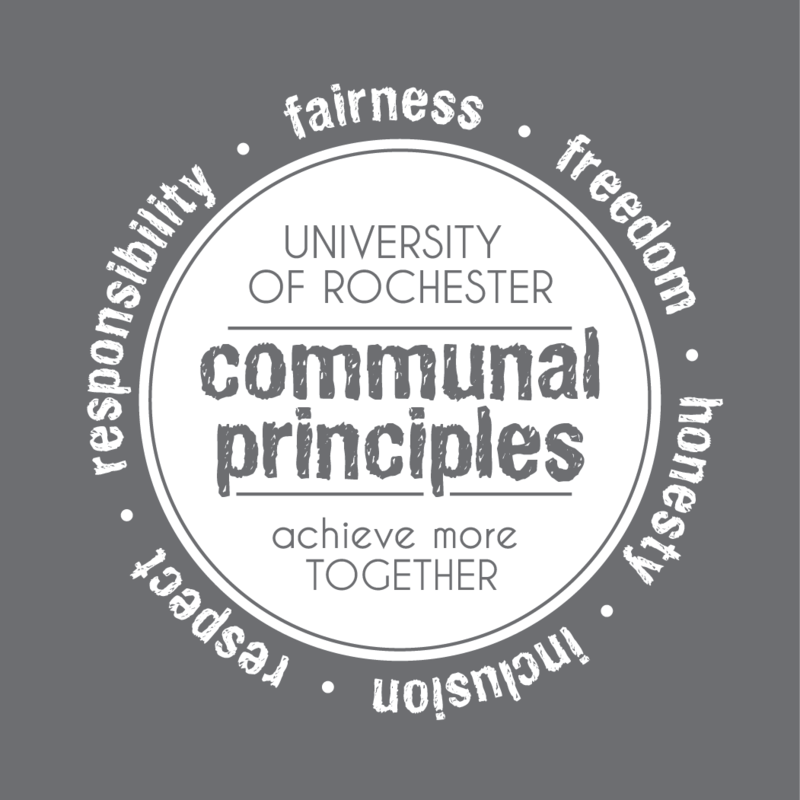 It is these principles that we use to develop systems and processes that safeguard the special nature of the College community and to ensure the involvement and inclusion of all its members. The principles of fairness and openness are fundamental to the operations of this community–its processes for decision-making, problem solving, and doing the work of the institution. Every person has the right to, and should expect, fair treatment according to openly stated and clearly articulated expectations, policies, and procedures and in accordance with the fundamental rights and privileges of a free society. Every person is encouraged in parallel ways to use fair and open methods of communication and action, including whenever possible, those provided by existing institutional channels, in voicing concerns and seeking solutions to problems. The freedom of all people in a community of learning to ask questions and to seek answers is essential and actively encouraged. Each person has the right to learn, teach, and work–to express themselves through their ideas and activities–without threat to his or her education or career progress or to that of others. Honesty and personal integrity are fundamental to all assumptions of participation in a community dedicated to the advancement of knowledge. Honesty advances our efforts as well as strengthens the interrelationships on which community is built. On the other hand, dishonesty undermines the search for truth and undermines the bonds between the persons who live, study, and work here. It further damages community by wasting the energy and educational opportunities of all involved. Our community welcomes, encourages, and supports individuals who desire to contribute to and benefit from the institution’s missions. Members of the University’s community come from different geographical areas, represent differences in ethnicities, religious beliefs, values, and points of view; they may be physically different, have different intellectual interests, or have different abilities. We not only welcome such differences in members of our community, but we also actively seek to include them in all aspects of the institution’s operations. Respect for the basic dignity of self and others is essential to this community. Every person has the right to be treated with respect, regardless of the many differences that distinguish individuals and groups. Respect involves showing regard for others' well-being and safety as well as for their personal property, personal space, and for their living, learning, and working activities. In addition, members of this community also have a responsibility to respect the properties and functions of the institution. Freedom and responsibility are two sides of the same coin. To uphold this kind of freedom of expression and action in the public arena, each person has the responsibility to own his or her ideas and actions as well as express them in ways that do not limit or threaten others’ freedom to learn, teach, and work. This means that ideas and actions are neither anonymous nor isolated. To act or express one’s ideas openly and in a responsible manner enhances the learning and growth of all. On the other hand, to act or express one’s ideas in an irresponsible manner impinges on other’s rights and freedom to learn and grow.